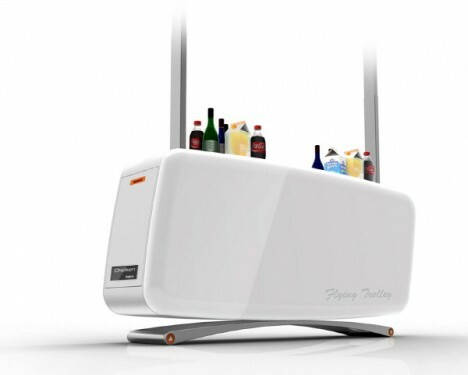 It never fails – when you’re on a long flight and have to get up to make your way to the lavatory, there is always a beverage or meal cart blocking your way. 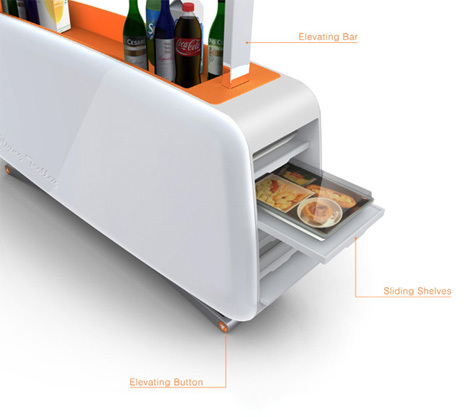 It’s been an annoyance to air travelers since the beginning of commercial air travel, but now Seongjoo Joh and Lee Min want to do something about it: raise the roof on the beverage cart madness. 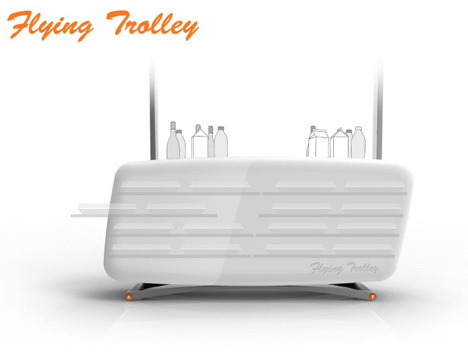 Their concept, the Flying Trolley, would relocate the massive carts from the aisles to the ceilings of planes. They would roll along tracks in the ceiling and lower down to the attendants’ height when they need to reach something. This would keep the aisle free so flight attendants and passengers alike could move around freely. Of course, as with anything aviation-related, there would be much more than mere convenience to consider. 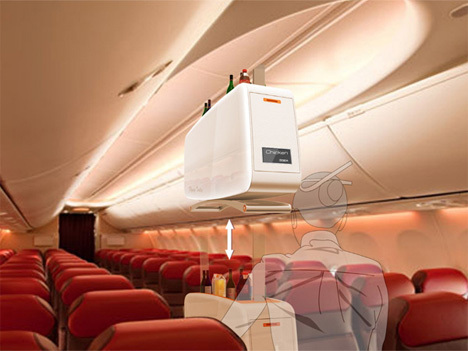 The added weight, the extra hardware, and the relatively unsecured nature of the hanging cart would ensure that this idea never makes it past the concept stage as an airplane innovation. However, trains could implement a similar system without the problems inherent in adding anything new to an airplane. If the system could somehow be automated so that passengers pushed a button and the trolley came “flying” over with their order, long-haul train rides might suddenly become a lot more appealing. See more in Mass Transit or under Transportation. May, 2013.